There were four people onstage last night at Alice Tully Hall, as part of Lincoln Center's Great Performers series. There was the veteran interpreter of art song Mark Padmore, there was the sensitive collaborative pianist Paul Lewis, there was the 19th c. Romantic poet Heinrich Heine, and there was the remarkable 19th c. composer of art song Robert Schumann. 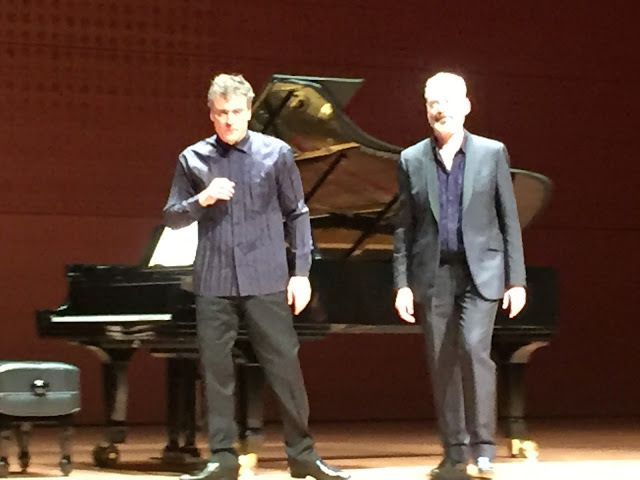 How wonderful to have an entire evening devoted to the Schumann settings of Heine's poetry, so movingly interpreted by Mr. Padmore and Mr. Lewis, whose intense sensitivity to the music and to the singer contributed greatly to an evening of pure delight. We confess to being completely mesmerized. Mr. Padmore made a few opening remarks about Schumann sending his songs to Clara as a means of communicating his feelings. Surely the young Robert did not mean to communicate the negativity toward love and toward women that we read in Heine's text. We know not what romantic injury Heine suffered to inspire such anger. We have been reading the poetry aloud and reveling in its astute use of the German language, it's rhythm and its rhyme. Would that a contemporary American poet could so inspire a contemporary American composer! In any event, Schumann's melodic vocal lines and luscious piano accompaniment went a long way toward softening the harsh sentiments found in Heine's poetry, poetry that inspired so many 19th c. composers. In the performances of Mr. Padmore and Mr. Lewis, we barely noticed the superlative technical aspects and chose to dwell on the communicative aspects. Mr. Padmore has had a long and illustrious career to focus on communicating emotions to the audience. By virtue of alterations of color and dynamics, and by means of sensitive phrasing, every ounce of emotion was conveyed. Mr. Lewis' attention to both the piano part and the vocal line made him the perfect partner for Mr. Padmore. He is the type of collaborative pianist that we most enjoy, always light of touch and leaving the final note suspended in the air. There was no mention of his collaborative work in the biography in the program but it was evident that there is a great deal more to his artistry than his solo performances and those with orchestras. The program included two cycles Schumann composed in 1840. As Mr. Padmore pointed out, they were never meant to be performed in a concert hall, but rather to be played and sung at home. We have observed the incredible intimacy they elicit when performed by students in recital at small venues. To our surprise, Mr. Padmore evoked the same feeling in the vast reaches of Alice Tully Hall. Liederkreis, Op.24 comprises nine songs about love and loss and was less familiar to us than the cycle that closed the program, Dichterliebe which we have heard countless times. In "Ich wandelte unter den Bäumen" we loved the tender coloration and the way the quotation of the bird song was differentially colored. In terms of piano and voice working together, we favored "Lieb Liebchen" which not only enjoys a memorable melody but also a piano part that recreates the hammering of the heart. The passionate "Warte, warte, wilder Schiffman" is remarkable for its scale passages in the piano and the touch of humor at the end. As a matter of fact, in almost every song Schumann employed a graceful postlude to somewhat undercut Heine's bitterness. He seems to want us to feel consoled. The familiar Dichterliebe is another story altogether; we have always thought of it as a spurned young man reflecting on the sanguine origin of his romance and the final despair when his beloved marries someone else. In the resolution of the final song, he buries all his sad songs in a coffin and sinks it in the Rhein, a fitting way to find what today is called "closure". One could not keep from being charmed by the melodious introductory lied, "Im wunderschönen Monat Mai", or puzzled when the song just trails off without the lovely piano postlude referred to earlier. It segues immediately into the tearful "Aus meinen Tränen sprießen", followed by the exuberant "Die Rose, die Lilie, die Taube". Love is like that, especially in the young. Observe any teenager with his cyclothymia! She loves me, yay! She loves me not, woe is me! In "Im Rhein, im heiligen Strome", the poet sees his beloved everywhere, even in a portrait in the cathedral in Cologne! We were waiting to hear what Mr. Padmore would do with "Ich grolle nicht". He held back on the bitterness until the end, a valid and interesting interpretation. We heard such rapid figures in the piano in "Und wüsten's die Blumen" and in the bitter "Das ist ein Flöten und Geigen" that the quiet spare piano part of "Hör' ich das Liedchen klingen" came as a surprise. Also of interest was the contrast between the jolly piano part of "Ein Jüngling liebt ein Mädchen" and the painfully ironic text. Perhaps our favorite song was "Ich hab' im Traum geweinet" in which the voice begins a capella and the piano part comprises a punctuation of chords. We think of the evanescence of dreams and Mr. Padmore conveyed the intimacy of a confession. In between these two major Schumann cycles we heard some of Brahms' settings of Heine's poetry. It seemed to us that Brahms, a protegé of Schumann, chose texts of less emotional import. Truth to tell, we mostly prefer Brahms' settings of folk songs and cannot say why. There was nothing wrong with the later life songs we heard last night but presenting them in between two such major cycles probably did not give us a chance to appreciate them fully.